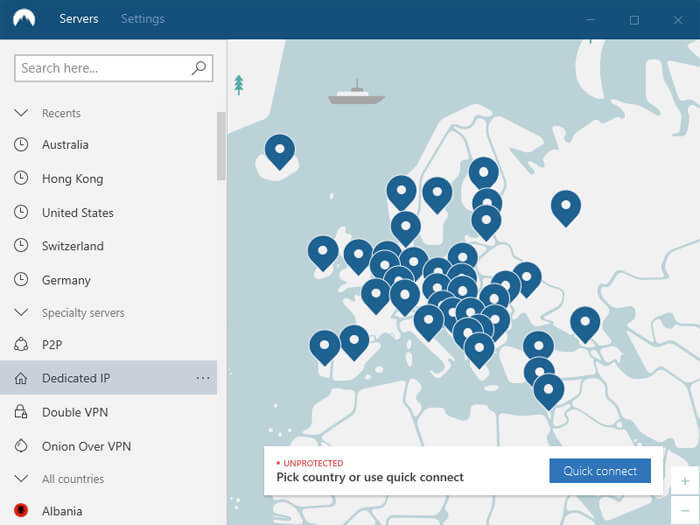 NordVPN Review 2019: Is this top rated VPN any good? The word is that NordVPN is one of the best VPN services available, but how true is this? We aimed to find out, so we’ve been testing their service thoroughly to see if the claims are true. It is capable of providing access to the internet without any borders, while at the same time, it guarantees complete privacy and advanced security. In the age where hackers threaten online privacy and security, the government agencies are snooping evermore, and censorship on the increase – choosing a proper VPN is a necessity, but should NordVPN but it? Let’s find out. When it comes to prices, NordVPN is one of the most affordable VPN services around. It features several plans, each with its own prices and significant discounts. 3-Years – $2.99 /mo – Biggest Discount: Save 75% off! NordVPN offers a basic plan of $11.95 per month, and this plan offers the same features as all the other packages. However, it is the most expensive one, and it needs to be manually renewed every month. The second one is a 1-year plan, and this one provides a significant discount. It will cost you $83.88 per year, but only $6.99 per month, allowing you to save up to 41%. Next, there is a 2-year plan with an even greater discount, going up to 66%. This one costs $95.75, or $3.99 per month. Finally, there is a 3-year plan with a massive 75% discount. It is charged only once in three years, and it costs $107.55, or $2.99 per month. All plans feature a 30-day money-back guarantee, and you can purchase via credit card, cryptocurrencies, or many other ways. NordVPN offers apps for a number of different devices and systems. When it comes to mobile apps, it supports Android, as well as iOS devices, including smartphones and tablets alike. 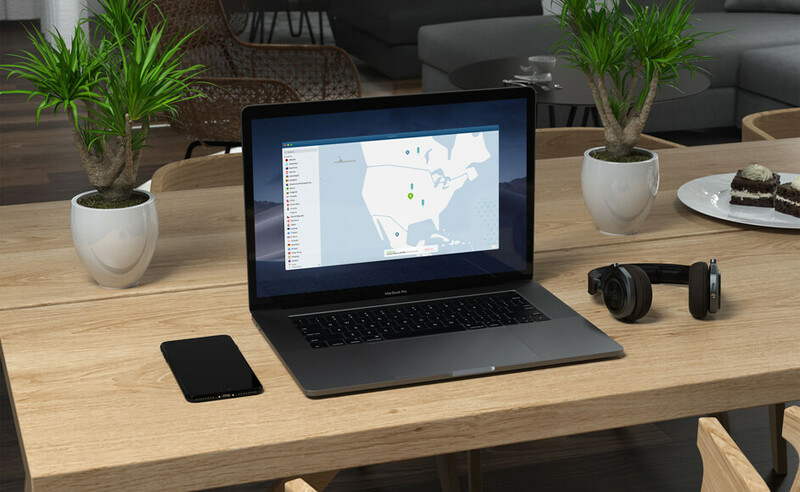 You can connect up to six different devices at once, which makes NordVPN perfect for those with various devices, as well as those who wish to protect the devices of their entire family. Mobile apps are very intuitive, which makes them easy to use, and pretty much everything is available with only a few taps. You can establish an instant connection with a ‘Quick Connect’ feature, and enjoy complete online freedom and privacy on the go. NordVPN mobile apps are super well designed. 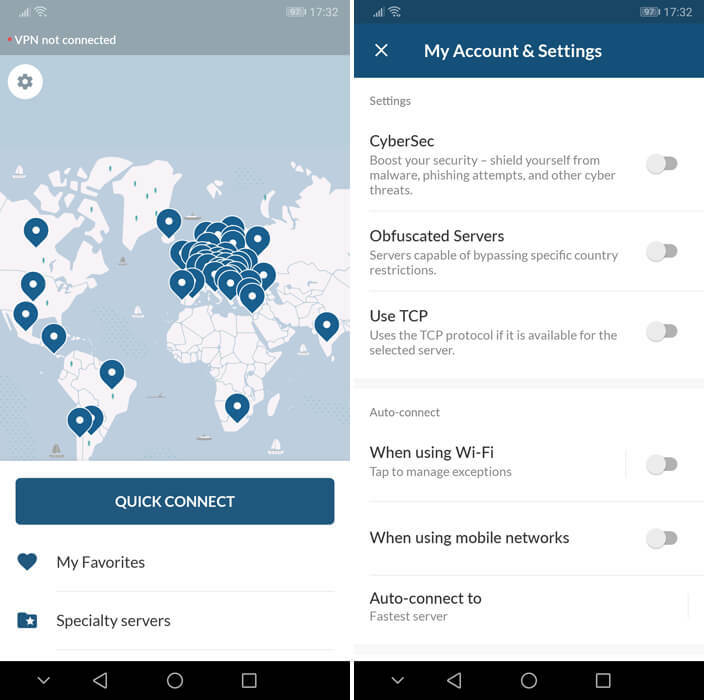 NordVPN mobile app allows access to numerous servers, and it uses TCP/UDP protocols to keep you safe. In addition, it will enable you to add an extra security layer by connecting to P2P, Double VPN, and Onion Over VPN servers. There’s also an option to use their ‘CyberSec’ service to protect your mobile device from malware, phishing and other cyber threats and ‘Obsfuscated Servers’ if you’re struggling to connect on a particular network. The iOS app uses IKEv2/IPsec security protocol, and it also features a kill switch, in addition to all the other benefits mentioned earlier. Alongside the mobile apps, NordVPN also covers many other devices, such as desktops, laptops, and even the Amazon Fire TV. When it comes to systems, it works great with Windows and Mac, featuring the same Quick Connect button mentioned earlier. Further, the app can be set to launch on startup, and you can connect to any number of different servers. In addition, there is also a CyberSec feature, which can protect you from various malicious threats online. NordVPN’s desktop apps are well designed. The app uses OpenVPN protocol, offers a kill switch, custom DNS, and it also has a feature called Obfuscated servers which can prevent your traffic from being blocked. All of these features are present on Mac and Windows systems alike, with the only difference being that the Mac app offers different protocols. I liked the simplicity of the design of NordVPN’s desktop apps. Connect can be made quickly via their map selector or a country listing. Plus as a handy addition, your most recent servers start to build up in a list allowing you to connect to all your regular favourites quickly. There are plenty of settings to play around with. As for Smart TVs, the app allows users great speeds which are perfect for streaming, and it is easy to activate it with a single click. It works on Android TV as well as on Amazon Fire TV Stick. With this service, there will be no limit to what content you can access, no matter where you are or what devices you choose to use. Meanwhile, you will remain perfectly safe from prying eyes or malicious threats. When it comes to servers, NordVPN is among the services with the largest server network in the world. It features 5,378 individual servers in 61 countries, meaning that employing this service will unlock the entire world’s content, no matter what you wish to gain access to. The service features 508 servers in the Asia Pacific area, including countries such as Australia, Japan, Singapore, Hong Kong, New Zealand, South Korea, Taiwan, and others. There are as many as 2265 servers in the Americas, 1824 of which are located in the US alone. Others are located throughout the two continents, in countries such as Canada, Mexico, Brazil, Argentina, Costa Rica, and Chile. There are another 2549 servers in Europe, most of which are in the UK, and others being in the Netherlands, Germany, France, Sweden, Switzerland, Norway, and many other countries. Finally, there are 59 servers in the Middle East, India, and Africa. 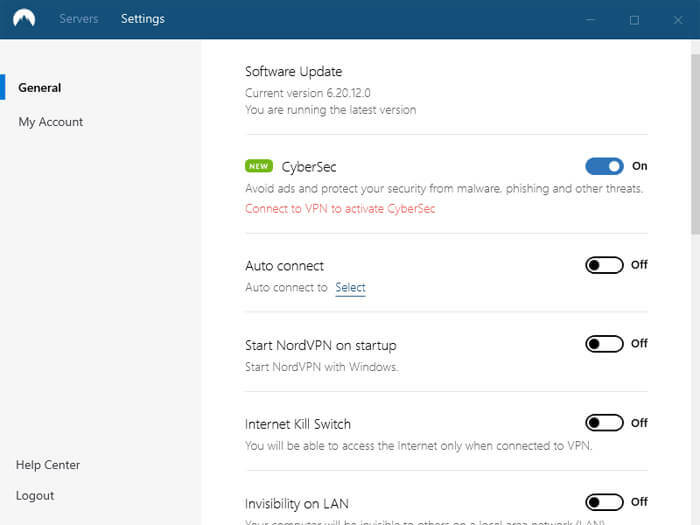 NordVPN is one of the best VPN services we’ve tested for unblocking content. While they don’t quite unblock as many TV services as ExpressVPN for example, they do unblock all the most popular services. We had no trouble streaming US Netflix or BBC iPlayer which are two of the most popular services to unblock from other countries. One thing to note is US Netflix is available across NordVPN’s entire network. So no matter what country you connect to you’ll be able to watch US Netflix. While this is a great feature, it does mean you can’t access other countries Netflix service while using Netflix as it’s restricted to US Netflix only. Naturally, it is important for a VPN service to feature great speeds to be useful, and NordVPN covers this aspect pretty well, too. Its servers are many, which prevents them from being overcrowded. As a result, the service has excellent speeds which are perfect for various activities, such as streaming your favorite shows, movies, or other types of high-quality video content. We had no issues carrying out our everyday internet activity while staying connected to the VPN continually. To put the service to the test, we did some speed tests from our UK based test connection. Our speed without a VPN was 63.36 Mbps. NordVPN also provides full protection when it comes to downloading files, or simply browsing the web. You can even use it for torrenting, which is a big plus for a VPN service since not many of them provide this type of support. All of this can be done with no limits in terms of bandwidth, making NordVPN one of the best services available. In the end, is NordVPN a good VPN service? Our answer is Yes. The service features multiple plans, all of which are more than affordable, with the last one being less than $3 per month, and it will last you an entire three years. Meanwhile, there is also a 30-day money-back guarantee, which will let you get your money back if you find the service dissatisfying. Next, the service features mobile apps for Android and iOS systems alike, meaning that you can use it on pretty much any phone or tablet and enjoy all of the benefits it provides, including excellent protection, high speeds, and access to all of the servers. The same is true for desktop apps, which support both, Windows and macOS systems, keeping your connection smooth and safe while providing you access to the open internet. Even Smart TVs and the Amazon Fire TV are included in the offer, which means that you can stream any content from anywhere in the world. As for servers, there are thousands of them, more than any other provider in fact, spread around the world, and on every continent on the planet, apart from Antarctica. The servers are fast and many in number, meaning that they will not be overcrowded, which is a great plus. We recorded some of the fastest download speeds this year on the NordVPN service. There are also no bandwidth limits, and you can use the service for P2P file sharing, which will be of great benefit to a large number of users. Overall there is actually very little to fault NordVPN on. Because of this, we believe that NordVPN sits among the top services in the industry, and we definitely recommend using it.